The 2016-17 All-EuroLeague Team presented by 7DAYS! The Turkish Airlines EuroLeague enjoyed historic firsts throughout an unprecedented 2016-17 season, none more important than every elite team in Europe playing every other, home and away, for the first time ever, guaranteeing great entertainment for fans across the continent. All thanks go to the players who suited up for the 16 teams and gave their best every night in the longest season on record in European competitions. Among them, Euroleague Basketball offers a special salute to the 10 players who, after voting by fans and accredited media members, have earned places on the 2016-17 All-EuroLeague First and Second Teams, presented by 7DAYS. This season's group features stars from seven different teams. The All-EuroLeague First Team is made up of Nando De Colo of CSKA Moscow, Sergio Llull of Real Madrid, Georgios Printezis of Olympiacos Piraeus and Fenerbahce Istanbul teammates Bogdan Bogdanovic and Ekpe Udoh. 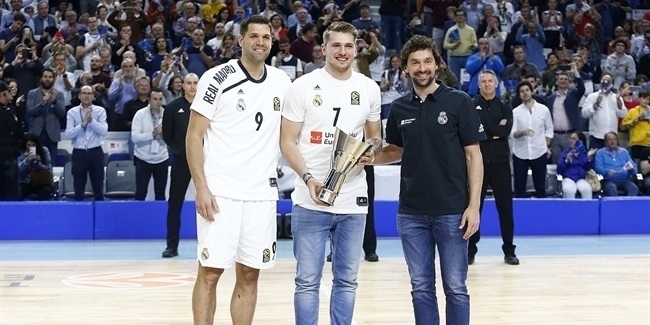 On the All-EuroLeague Second Team are Gustavo Ayon of Real Madrid, Bryant Dunston of Anadolu Efes Istanbul, Nicolo Melli of Brose Bamberg Milos Teodosic of CSKA Moscow and Brad Wanamaker of Darussafaka Dogus Istanbul. The voting is made without regard to player positions. Ayon, De Colo, Teodosic and Udoh are the returning players from the 2015-16 All-EuroLeague teams, while Printezis, Bogdanovic, Dunston, Melli and Wanamaker are earning the honor for the first time. The 2016-17 MVP will be revealed at the Turkish Airlines EuroLeague Awards Ceremony on Saturday, May 20 during the Final Four in Istanbul! Sergio Llull is the undisputed leader of Real Madrid, the team that posted the best record in the regular season and heads into its fourth Final Four appearance in five years. Llull, 29, is the motor of Madrid's finely-tuned offense and this, his 10th EuroLeague season, has proven to be his best to date. Llull ranked third in the league in assists (5.9 apg.) this season, fifth in scoring (16.4 ppg.) and eighth in performance index rating (16.8), which were all career highs. When the stakes were raised, the Madrid playmaker boosted his number to 18.5 points and a 17.8 index rating for the playoff series against Darussafaka Dogus Istanbul. Llull started in each of his 31 appearances this season and led the team in minutes played (27:44 per game), while making a total of 70 three-point shots for the season, another personal best and the fourth most in the competition. Llull was named MVP of November, a month during which he averaged 21.4 points per game. He also earned MVP honors for Rounds 7 and 27. For Llull this is the second All-EuroLeague selection; he was named to the 2010-11 All-EuroLeague Second Team. 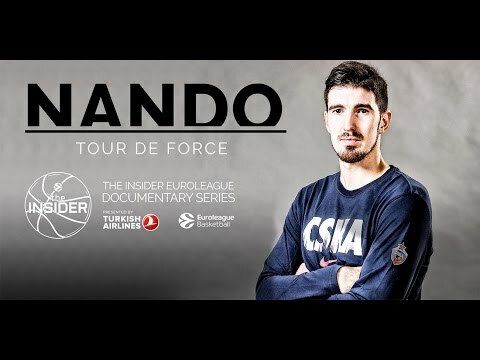 CSKA Moscow's historically prolific offense has become hard to imagine without Nando De Colo, who never lowered the bar he set last season when he became the first player ever to win the Alphonso Ford Top Scorer Trophy and to be voted both the full-season and Final Four MVP. De Colo simply continued where he left off; he was the competition's second-best scorer (19.4 ppg.) this season and posted the second-highest average performance index rating (21.5). De Colo scored in double figures in all but one of his 26 appearances and his consistent all-around contributions are perhaps best showcased by his five MVP of the round honors this campaign, which was more than any other player this season and one shy of the all-time single-season record. De Colo was second in the competition in free throw accuracy (95.6%) and third free throws made (129). He also dished 4.0 assists per game. De Colo had the highest average performance index rating of the regular season (22.7), which all built his case in earning his third consecutive All-EuroLeague selection and second in a row as a member of the first team. Bogdan Bogdanovic spent nearly half of the regular season sidelined due to an injury, but when he came back the two-time EuroLeague Rising Star Trophy winner made up for lost time. Bogdanovic fueled Fenerbahce's return to its third consecutive Final Four by putting together the best season of his career. Bogdanovic, 26, ranked sixth in the competition with an average performance index rating of 17 and also led Fenerbahce with 14.5 points and 1.1 steals per game, while dishing the second-most assists (3.9 apg.) and collecting the fourth-most rebounds (3.7 rpg.) on the team. Bogdanovic was at his best when his team needed him most with a historic performance in the playoffs, when his average index rating of 26.0 was the best ever in a series that finished in three games. He was MVP for both Games 1 and 2 of the sweep of Panathinaikos Superfoods Athens and went on to rank second in the playoffs with 19.3 points per game. His 4.0 three-pointers made per game matched the highest average in playoffs history, and he was tied for third among playoff rebounders with 7.0 per game, which was the second-highest ever for a guard. It all amounted to MVP of April honors for Bogdanovic, and now his first All-EuroLeague selection. A two-time EuroLeague champion and veteran of 14 EuroLeague seasons, Olympiacos Piraeus power forward Georgios Printezis finds himself among the All-EuroLeague honorees for the first time in his career. The 32-year old Olympiacos hero is playing the best basketball of his career, which has resulted in one of his finest campaigns by the numbers. This season, Printezis helped guide the Reds to their fourth Final Four appearance in the past five years by leading the team with 12.9 points and an average performance index rating of 15.2 per game. He was also second best on the team with 39.7% three-point accuracy and 5.2 rebounds per game. Printezis totaled career-bests for a single-season in assists (31) and steals (20), too. He has been especially consistent since January, after returning from injury. In 18 games since then, Printezis scored in double figures 15 times and earned MVP honors in Round 22. A driving force for the team from Piraeus, Printezis now returns to Istanbul, the scene of his iconic last shot in the 2012 Final Four, to try to lift Olympiacos to glory again. A massive presence in the paint for Fenerbahce Istanbul, big man Ekpe Udoh has had a season like few other big men in EuroLeague history. Udoh was the EuroLeague leader in rebounds (7.6 rpg.) and blocked shots (2.1 bpg. ), in which he is the also competition's career leader with 2.2 per contest. Even more important than his numbers was his consistency, as Udoh had either multiple blocks or at least 5 rebounds in all but one game he played this season. The Fenerbahce center also led his team in minutes played (31:38), spending more than 30 minutes on the floor in 21 of his 29 appearances. Udoh, who was the runner-up in voting by the head coaches of the league for the EuroLeague Best Defender Trophy, also took care of business on offense. He was second on the team in scoring (12 ppg. ), and fourth in both assists (1.9 apg.) and steals (1 spg.). He earned MVP honors in Round 4 of the regular season and Game 3 of the playoffs, which led to Udoh's second consecutive All-EuroLeague selection, and his debut on the All-EuroLeague First Team. A man who has become a fixture on the All-EuroLeague teams, CSKA Moscow point guard Milos Teodosic put together one the best seasons in his career to find his name among the EuroLeague's finest once again. Teodosic led the league with a career-best 7.0 assist per game, was fifth in average performance index rating (17.4), and also ranked sixth in the EuroLeague in scoring (16.2 ppg.). His assists and scoring were career highs. Teodosic made the second-most three-pointers among EuroLeague players with 72. The CSKA maestro was the MVP for October, when he averaged 9.5 assists in helping his team to an undefeated start of the season, after which CSKA never dropped below second place in the standings the rest of the way. Over the course of the campaign, Teodosic set a career-high index rating of 43 in Round 9, which was the highest for any player all season, and with a career-best 34 points and 10 assists in that game also became first player in competition history to post at least 30 point and 10 assists in a single game. For Teodosic, this is the sixth All-EuroLeague selection, which is the third-most in competition history. A historic season for Darussafaka Dogus Istanbul would not have been possible if not for point guard Brad Wanamaker. He joined the team last summer after his rookie EuroLeague season and took the reins of the team right away, leading it through the roughs waves of the regular season to the club's first ever playoff berth. In doing so, Wanamaker became one of the most dominant guards in the competition at both ends of the floor. He totaled the second-most points (569), accumulated the second-highest performance index rating (600), made the second-most field goals (180) and collected the second-most steals (51) in the EuroLeague this season. Wanamaker also played the most minutes (1,138:22) and finished the season ranked second in steals (1.5 spg. ), and fourth in both scoring (16.7 ppg.) and average PIR (17.6). He was just outside the league's top 10 with 4.6 assists per contest. As the only player in the competition to post such numbers in those four categories, Wanamaker earned his first All-EuroLeague honor and the first in club history. Brose Bamberg might have been the unluckiest team this season, ending up on the wrong end of tight games too often, but the performances of power forward Nicolo Melli helped the team remain competitive throughout the entire Turkish Airlines EuroLeague Regular Season. After having a breakthrough 2015-16 campaign, Melli improved even more this season, setting career-highs in points (11.5 ppg. ), rebounds (7.4 rpg.) – on both the offensive (1.3) and defensive glass (6.1) – and in performance index rating (16.9). He led the league in defensive rebounding, ranked second in total rebounds and was seventh in average index rating. A veteran of seven EuroLeague seasons, Melli accumulated career-best totals in pretty much every single statistical category and was the best of the best in the month of December, when he was chosen as the monthly MVP. Melli posted averages of 15.6 points, 8.0 rebounds, 2.3 assists, 1.2 steals and 1 block, with a PIR of 24.5 per game that month, but it was his efforts through 30 regular season games that make him an All-EuroLeague selection for the first time. A two-time EuroLeague Best Defender award winner, Bryant Dunston of Anadolu Efes Istanbul made his presence increasingly felt this season on offense, too, while remaining the defensive anchor of a team that was one win shy of a place in the Final Four. Dunston etched his name into the history books with a single-season record of 100 offensive rebounds, which shattered the previous mark by 17 offensive boards. Dunston was his usual intimidating self on defense, ranking fifth with 1.1 blocks per contest and seventh in the competition with 6.2 rebounds per game, which was also a personal best. He also set career-marks in scoring (10.7 ppg.) and average index rating (14.6). Moreover, when the playoffs arrived, Dunston did not shy away from the moment. He earned MVP honors for Game 3, led Efes in minutes played and was among the team leaders in points, rebounds, blocks, assists and PIR for the series against Olympiacos Piraeus. This is the first All-EuroLeague selection for Dunston in his fourth season in the competition. 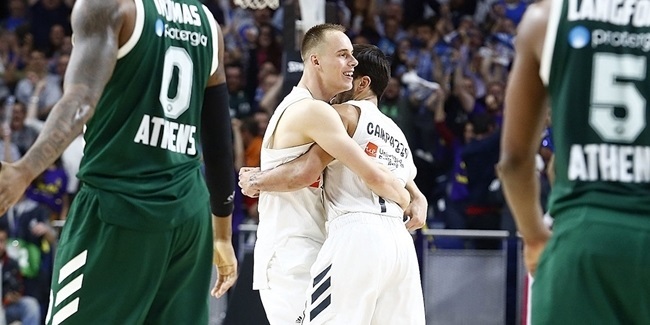 The only Real Madrid player to start every game this season, Gustavo Ayon has been a true reference in the paint for Los Blancos on their journey to the Final Four. Ayon was Madrid's second-best rebounder (5.2) and ranked among the top four on the team in scoring (10 ppg. ), assists (2.4 apg. ), steals (0.9 spg.) and blocks (0.6 bpg). What separated the 32-year old center from other players was his unmatched close-range consistency. Ayon made the most two-point shots in the competition this season (155) despite ranking 10th with 217 attempts, and led the league in both two-point and field-goal accuracy (71.4%). In the process, he also became the first man this century to shoot more than 135 two-point attempts with accuracy greater than 70%. 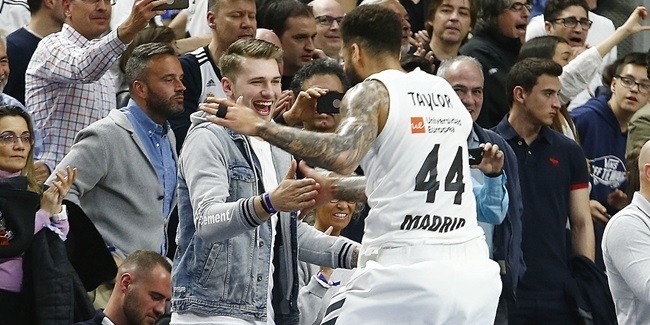 Ayon also came up strong in the playoffs; he ranked second for the stage with 7.3 rebounds, third with an average index rating of 20, and second on Madrid with 14 points per games, while missing only 7 shots during the entire four-game series. All of that helped Ayon to his second consecutive All-EuroLeague selection.